I'm still seeing gallery walls like the one below everywhere, and I still like them. But you can't put a gallery display on every single wall in your house or you're gonna look like a crazy person. Here are some other ideas to fill those empty walls. Framed wallpaper. 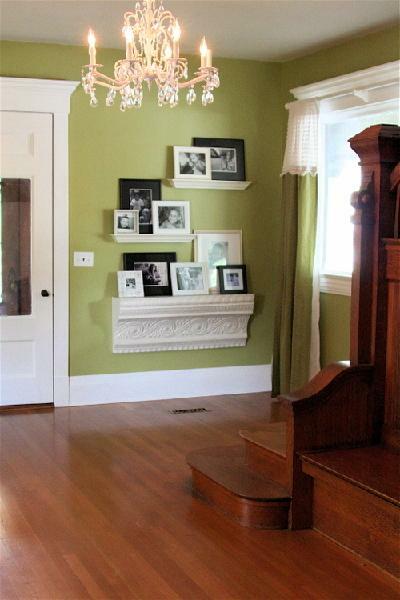 Enlarge family photos and frame - those are Ikea frames! Display 9 matching frames in a grid. All of these pictures are nice but I have no idea what they were of because all I could think about when I was looking at them were the faint, dainty stripes on the ceiling in the second picture. It ruined all other pictures for me, ever. love all these ideas. i like the grid look and those 3 enlarged ones too! LOVE those Ikea frames! Simple and gorgeous. That grid also looks amazing, but I find it impossible to get them all even. I have always loved lots of photos on the walls. It just makes it feel like home and brings so much memories. Family photos are best. Love these ideas! I have a HUGE blank wall that runs along the length of my house connecting my living and dining room that I'm having the hardest time deciding on what to put up. I have a wall gallery going up my stairs already that you can easily see from the living room so I really don't want to go on gallery wall overload and these are great alternatives. P.S. I didn't know Ikea sold those frames in such a large size! Another reason for me to be totally Ikea obsessed!! I like the large frames from IKEA. Simple and organized. They do not look like gallery-types of frame. We also have ledges in the living room, on the window areas but they are used to display flower pots and vases.